When I was in high school, I was really into Led Zeppelin. I always had one of their albums playing, and I even bought a guitar and fumbled my way through "Stairway to Heaven" and "Ramble On." Don't ask me to play for you now... My days of calluses and picks are done. One of my favorite tunes was "The Rain Song," from Houses of the Holy. It's more than 7 1/2 minutes long, and full of guitar and sweeping lyrics. This is the springtime of my loving- the second season I am to know. You are the sunlight in my growing- so little warmth I've felt before. But Robert Plant was wrong. It's not springtime, though to look at the markets these days, you'd think we're in full bloom. The Dow is only 8.5% below its October 2007 high, and fewer than 370 points away from a cool double off its March 2009 low. There are going to be a lot of investors hurt once this house of cards collapses. Consider this a personal wealth warning... We are not in the springtime of our investments. No one knows this better than Ian Gordon, founder of The Longwave Group. His Longwave Principle studies economic cycles -- or lifetime cycles, as Ian calls them. 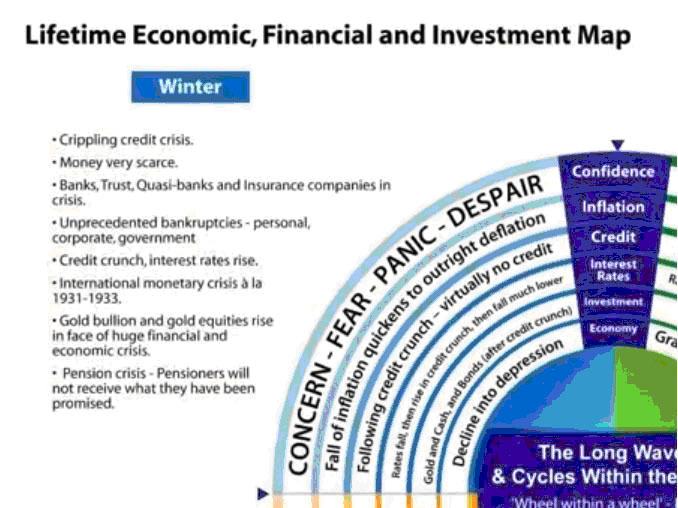 These cycles are broken down into four seasons. By all measurements, we are in winter. I had a chance to speak with him last month about just how bad the economy is and why investors might get caught holding the short end of the stick. The one thing he told me that the vast majority of investors don't know is that the whole purpose of an economic winter is to cleanse the system of debt. I think you'll agree that our economy right now ticks most of these boxes. But the problem is governments are keeping interest rates artificially low and pumping the system full of cheap cash.